A Call To Share (ACTS) aims to share our experience of Christ, our skills and our resources with the children, the poor & the needy in countries such as Cambodia, the Philippines, Myanmar and Vietnam. ACTS missions encompass medical care, education, catechesis, funding of schools, kindergartens & other facilities, distribution of food & other necessities to poor families and improvement to living conditions. In 2013, our parish supported the fund-raising efforts to help the Salesian sisters build a kindergarten outside Yangon in providing education for children from poor homes. The kindergarten is expected to be completed and take in children by mid-2015. 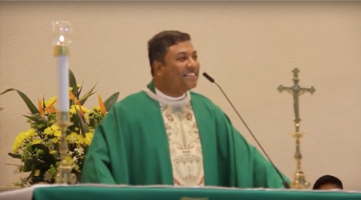 The Superior of the Salesian sisters has written to thank Fr Michael Sitaram and the parishioners of St Vincent De Paul for supporting their cause. In November 2014, ACTS carried out its first mission trip to Myanmar visiting three homes run by the Salesian sisters. Thirty three participants attended the mission including fourteen from our parish. The purpose of the mission was to support the sisters in their missionary work and serve the poor and needy. There were various initiatives undertaken during the mission. A social enterprise team taught the vocational girls how to sew table mats and hand bags for sale in Singapore. It also taught baking of cakes and cookies so that the girls would learn a new skill. An education team conducted English lessons and taught skills in preparing for work such as resume writing, interview skills and grooming. The mission catechists conducted a one-day CGS (Catechesis of the Good Shepherd) workshop for the sisters as well as daily catechesis with the girls. There was also fun and play for the girls and kindergarten children as the Activity team engaged them in games and activities. A medical team conducted health education and provided health screening for the kindergarten children and girls from the homes while also treating villagers. Through the effort of the painting group, several walls have been given a fresh new look while a kindergarten has been transformed by the painting of a mural. Visits were made to the homes of poor villagers, to whom the participants distributed parcels containing food and essentials. Responding to an appeal by poor villagers in an isolated area without proper water supply, ACTS made a donation to them for the construction of a well. Spirituality during the mission was emphasized with the participants attending daily Mass and reflection sessions. Many mission participants had a significant experience during the mission, arising from their interaction with the sisters, the girls, kindergarten children and villagers. To some, it was a milestone in their faith journey. Perhaps you may consider joining the ACTS Myanmar mission as part of your faith journey.